Hi, I’m Jenny. I love cookbooks and have a bit of a cookbook addiction. Everyone: “Hi Jenny!” Cookbooks are inspirational to me in my meal planning. I love to try new recipes and often change up recipes to make them my own. For as long as I can remember I have always loved cooking, cookbooks and anything that has to do with the kitchen. My love of cookware, tart pans and rolling pins is bordering on scary – but only for my husband. He fears I may move him out to make more room. My mother was not much of a cook. Out of high school and working for a doctor, I often would babysit he and his wife’s little daughter. The doctor’s wife was an incredible cook and always had some tasty, exotic dish in the refrigerator for me to snack on. She also had a cookbook collection and when she purged some titles – I was happily lugging a dozen cookbooks home and that is where the cookbook love started with me. One of those titles is still in my collection, Miss Hulling’s Favorite Recipes – I can’t part with it – it was my gateway to all things cooking. After Andrew, my eleven year old, was born, I started a Facebook group called, The Cookbook Junkies in order to socialize and share my passion. Today, we are nearly 22,000 members and growing. I review cookbooks at my website of the same name, The Cookbook Junkies, and also have a weekly column for TasteBook. The true benefit of starting The Cookbook Junkies besides the career I am able to achieve at home, has been the incredible friends I’ve met in real life and online. A few of these friends are members of the 37 Cooks team. Home cooked meals are preferred over almost anything we can purchase at a restaurant. My favorite cuisines are anything international but being married to a man of simpler tastes, I cook a great deal of comfort food. 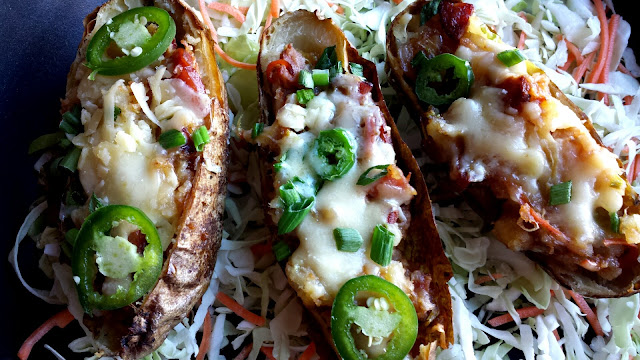 Always on a quest to cure my husband’s anti-potato issue (really, who doesn’t like potatoes – some Irish man he is), when I saw these Cleveland Stuffed Potatoes on Food Network, I’d thought I’d give them a try. They incorporate a lot of ingredients that my son and husband enjoy – kielbasa, cheese, cole slaw – what’s not to love? These stuffed potatoes were easy to throw together and so tasty. Perfect football food and a great appetizer for a party. We had them for dinner with a salad – and they were fantastic! Poke several holes in the potatoes with a fork, place on a baking sheet and rub with the olive oil and a generous sprinkling of salt and pepper. Bake until a fork easily pierces the flesh, about 1 hour. Let cool slightly. Put the diced kielbasa in a large skillet with the oil and then turn the heat to medium. Cook, stirring occasionally, until the fat starts to render, and the sausage is golden in places, about seven minutes. Add the coleslaw mix and stir until just wilted, about four minutes. Transfer to a large bowl. Cut the potatoes in half lengthwise and scoop out the flesh, leaving a wall of potato and skin so they can hold on to the filling you will be spooning in soon. Add the potato to the bowl with the kielbasa mixture and stir in the butter, scallions, 1 cup of shredded cheese, 1/4 cup of the barbecue sauce, 1 tablespoon of mustard and 1 teaspoon salt. Season with salt and pepper. Put the stuffed potato on the baking sheet and spoon the filling into them. Sprinkle the remaining cheese evenly over the tops. Bake until the cheese is melted and the tops are browned in spots, about 20 minutes. Sprinkle the tops with the reserved scallions and sliced jalapeños and serve immediately. Can be served with extra barbecue sauce on the side. Don't know what to make for dinner? Just roll those dice! 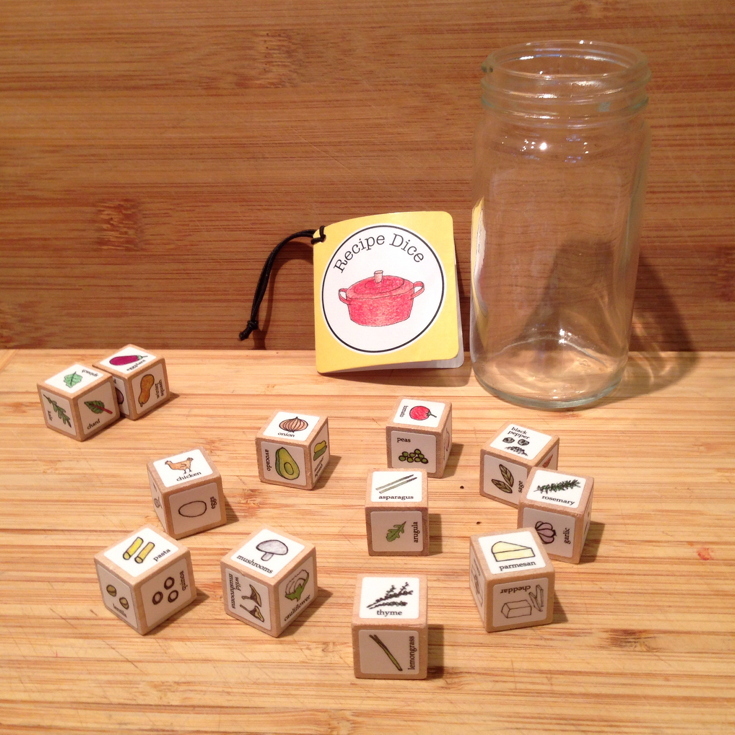 Leafcutter Designs supplied us with these amazing 12 Recipe Dice for this challenge. They also have a vegetarian version, along with cocktail dice, dessert and chai ones. For the lamb: After removing the excess fell and fat from the lamb, it's time to make the rub. In a small bowl blend together the salt, pepper, garlic, rosemary, oregano, mustard and oil. Slash the meat all over with 1 inch long and about 1/2 inch deep cuts. Slather the meat on all sides with the rub. Be sure to get into the grooves. Let the lamb rest for 1 hour before roasting. Heat oven to 425°F. 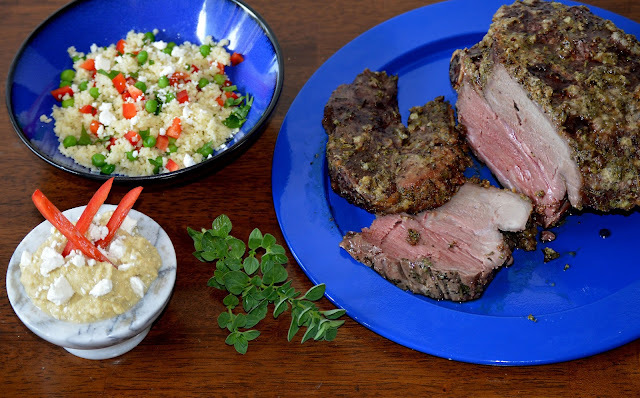 Place the lamb into a medium roasting pan outfitted with a rack. Pour the chicken broth into the bottom of pan. Roast the lamb 20 minutes to get an initial crust and seal in the flavors. Reduce the oven temperature to 325°F and continue to cook until internal temperature at the bone reaches 130-135°F (medium-rare). About 50-65 minutes, depending on your oven. Increase oven temperature to broil, and cook another 5 minutes to crisp the meat. Remove from oven and let rest 20 minutes before carving. For the couscous: Cook one box of Mediterranean-style couscous according to box directions. Meanwhile, in a medium bowl, add the parsley, peas and bell pepper. Mix in the couscous. For the artichoke puree: In a food processor, blend the artichoke hearts, garbanzo beans, red pepper flakes, lemon juice and zest until well blended. If needed, add some of the marinade from the artichoke hearts. Note for the garbanzo beans: For a smoother texture, make sure the skins are removed from the beans. Add salt and pepper to taste. Pour into a small serving dish and garnish with the feta and bell pepper. Serve lamb with a couple of spoonfuls of red currant jelly, a side of the couscous, artichoke puree and chips for dipping. 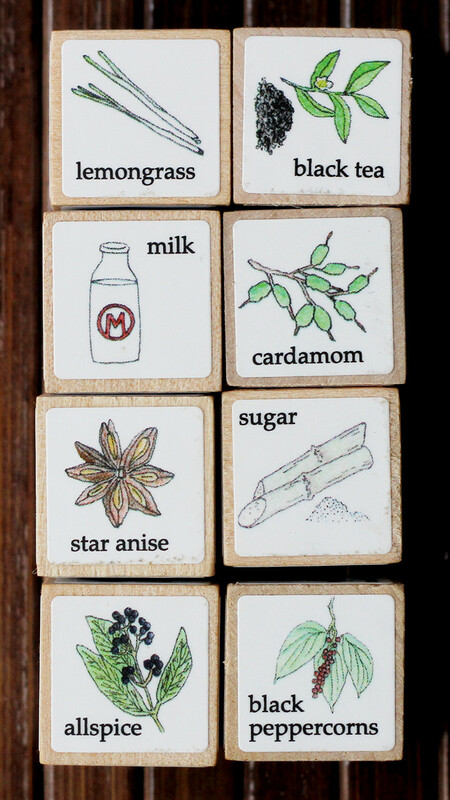 It was fun to receive the Chai Dice from Leafcutter Designs this month. While staying with my sister, we spent time in the kitchen rolling the dice and making various combinations, and this one was our favourite. Simmer the black tea with the water, honey, mint, and cinnamon. Pour into tea cups and add a small amount of milk. Garnish with a vanilla bean and sprinkle with cocoa powder. Serves 2. Leafcutter Designs, a unique creative design studio in Berkeley, CA, has a ton of nifty gifts and art products. When they offered to sponsor 37 Cooks for a challenge, I was really excited. Who doesn’t need a little added inspiration in their cooking regimen? 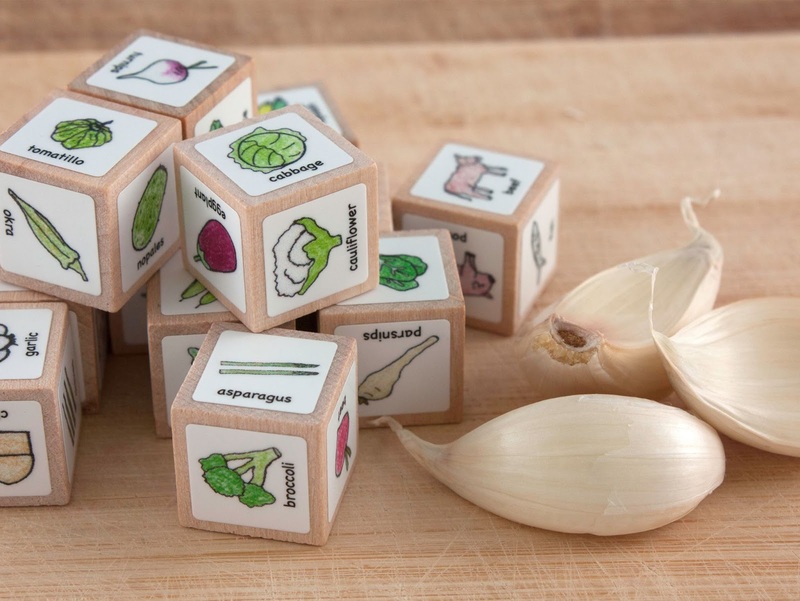 Their Recipe Dice come as a set of twelve dice made of solid wood, and feature more than 60 seasonal vegetables, hearty grains, juicy meats, flavorful spices, and succulent herbs. With a simple roll of the dice, these cool cubes will provide endless suggested menu combinations, and will be a terrific addition to your creative kitchen. Perfect for gift-giving, make your favorite foodie’s day with this jar of fun. 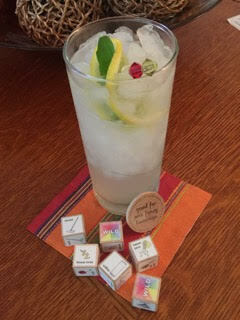 In addition to a vegetarian version, they offer Cocktail and Chai Dice, too! My roll for this recipe included: Lentils, chicken, mushrooms, spinach, smoked paprika, cumin, and chili flakes. I’d never cooked lentils before, so this was a new, inspired dish for me. And it turned out to be a delicious one, too! A hearty side dish, these lentils are great drained and mixed with your favorite fresh greens and protein for a cool salad entrée. Rinse lentils with cool water; drain and set aside. In a large stock pot, heat oil over medium-high heat. Add onions, celery, and pinch of sugar and cook until aromatic and slightly brown, about one minute. Add garlic, smoked chicken, mushrooms, paprika, cumin, Aleppo, pinches of salt and pepper, and cook, stirring, until all ingredients are coated and fragrant. Add stock and water, and bring to a boil. Reduce heat and simmer until liquid is well-infused, about 20 minutes. Add lentils, return to a simmer, and cook with lid ajar for 20-30 minutes, or until slightly tender. Add spinach, and continue cooking until lentils are tender, about 10 minutes more. Correct seasoning, adding more salt and pepper as desired. Garnish with parsley and serve. What a great idea! I wish I had invented “Recipe Dice." Leafcutter Designs has come out with several types of inspirational dice to help get your creative juices flowing when it comes to cooking, cocktail making or Chai (though I’m not familiar with “Chai” so if you know what Chai is…you’re at least one up on me!) The three sets you can choose from are Cocktail Dice, Chai Dice, and Recipe Dice. 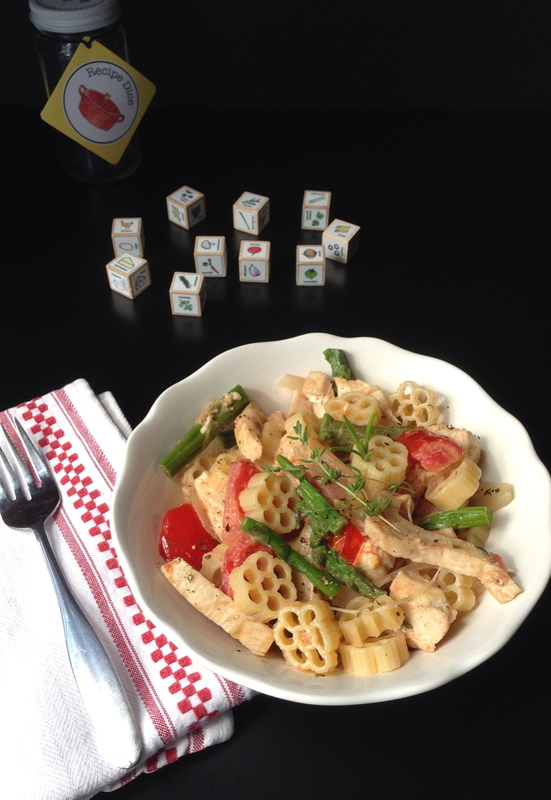 The idea is that you roll the dice and make something out of the ingredients that you roll. It’s harder than you think. Once you get over the fear of rolling the dice and getting some really odd combination of ingredients, it’s a lot of fun and super inspiring. I chose the Recipe Dice, and the meal ideas are seemingly limitless. When I opened my little box containing the newest 37 Cooks challenge, I was very excited. 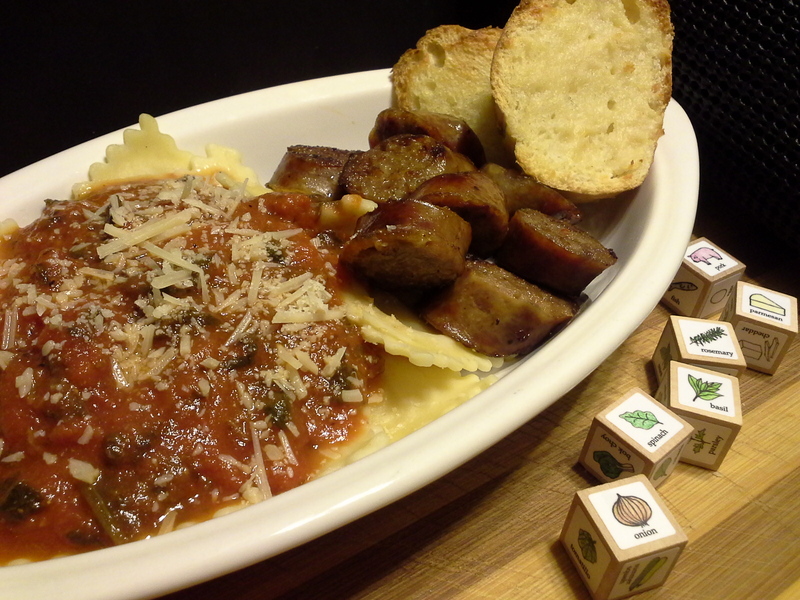 I played with the dice a bit, trying to coax them into a meal I thought I could create with little to no anxiety. But, with every toss of the dice, with every attempt to manipulate the ingredients list, I felt guilty for not playing the game the way it was intended. So I left the dice in their cute little spice jar on my kitchen counter for a couple of weeks, knowing full well I had to face them eventually. Every time I walked into the kitchen I would see them there, staring back at me. Goading me into trying to create something new and different. I decided enough was enough. I re-read the instructions, rolled the dice, then, according to the directions, I picked five ingredients that I wanted to change, and re-rolled those five. I decided to stick with what fate handed me (no fudging with the ingredients to make them fit). The dice I rolled included pork, rutabaga, Parmesan cheese, summer squash, asparagus, black pepper, kale, oregano, pasta, artichoke, lemon, and bell pepper…E-I-E-I-O! It was as if the dinner gods spoke to me. I couldn’t believe it, but I managed to whittle out a dinner with all of the ingredients that tasted really good. And it forced me to use ingredients together that I would ordinarily have never considered combining. Spoiler alert! Everyone I know is getting a set of these dice for Christmas! That’s just how I roll! Preheat your oven to 200ºF. Remove the silver skin from the pork tenderloin and cut the tenderloin into 6 equal 2 1/2 to 3-inch disks. Working with one piece of pork at a time, place each pork disk between two sheets of plastic wrap and pound them flat until it’s about 1/4-inch in thickness. Combine the flour with 1 teaspoon salt and 1/2 teaspoon black pepper in a shallow dish. In another dish, beat the eggs and water lightly together until combined. In a third dish, combine the Panko bread crumbs, Parmesan cheese, 1 teaspoon salt, 1/2 teaspoon black pepper, and the garlic powder. Heat two Tablespoons of vegetable oil in a large skillet over medium-high heat. Dredge one of the pork cutlets in the flour, shaking off excess flour. Dip into the egg and water mixture. Then coat the cutlet in the Panko and cheese mixture, pressing the cutlet into the bread crumbs to make sure they stick, and place in the hot skillet. If your skillet is large enough, you can cook two cutlets in the skillet at one time. While the first two are cooking, start working on the next two cutlets. Cook for two to three minutes per side. When golden and crispy, place on baking sheet and keep warm in the oven until all 6 cutlets are cooked. 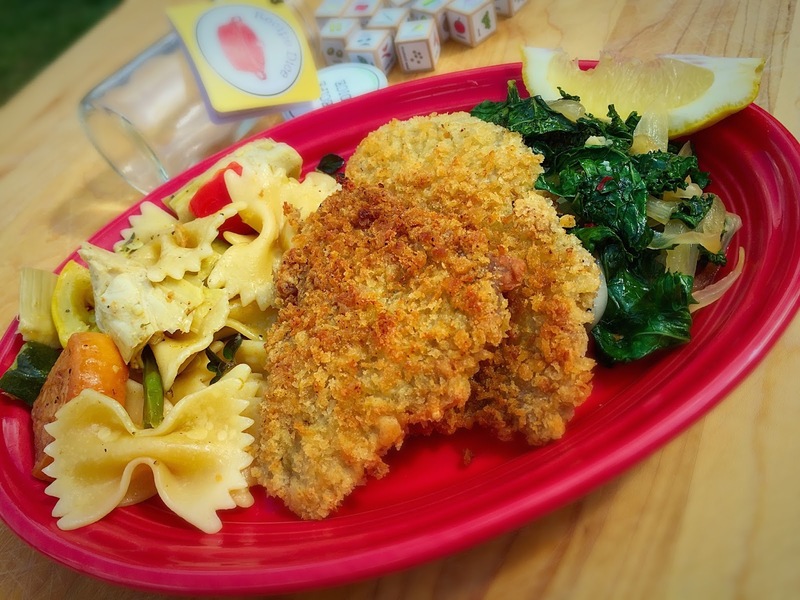 Add 2 more Tablespoons of vegetable oil to the skillet and cook the next two cutlets. Once again, place the cooked cutlets in the oven with the others. Finally, add the remaining two Tablespoons of vegetable oil to the skillet and cook the last two cutlets. Serve hot with sliced lemon. In a large skillet, heat the vegetable oil on medium high. When the oil is hot (it should be shimmering), add the onions. Sauté for 2 to 3 minutes. Add the kale, garlic and red pepper flakes and stir until the kale is wilted, about 2 minutes. Take off the heat and add the lemon juice and salt. Toss to coat and serve hot. Preheat oven to 400ºF. Coat the rutabaga in 1 Tablespoon of the vegetable oil, 1/2 teaspoon of salt, and 1/2 teaspoon black pepper. Place on baking sheet and roast for 20 minutes (turning half way through). Cook the farfalle pasta according to the directions on the box, drain, and set aside in a large bowl. Combine asparagus, bell pepper, yellow squash, and zucchini squash in large bowl with remaining 2 Tablespoons vegetable oil, 1 teaspoon salt, and 1/2 teaspoon black pepper. After the rutabaga has roasted for 20 minutes, add these vegetables to the sheet pan with the rutabaga and continue to roast for another 20 minutes. When done, add the roasted vegetables to the pasta. Add artichoke hearts (I used the canned artichoke hearts in a brine) and the chopped oregano. Stir to combine. In a separate bowl, prepare the dressing by combining the lemon zest, lemon juice, vinegar, 1/2 teaspoon salt, 1/4 teaspoon black pepper, and olive oil. Mix well and then pour the dressing over the pasta and roasted vegetables. Stir to combine and serve warm or at room temperature. My sweetie would eat pasta everyday of the week if I let him. Sometimes it just makes sense to do it. I work, just like y'all do and there are some days that I just don't want to cook. 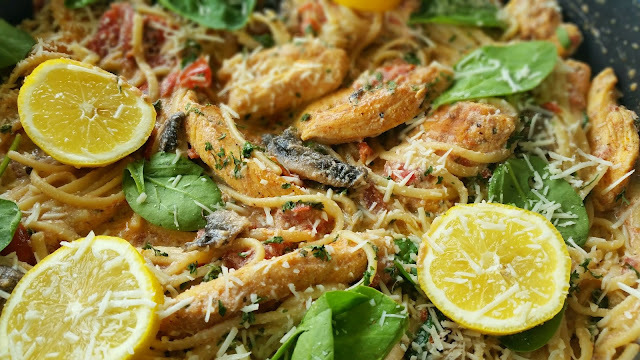 I will always have a simple pasta dish at the ready for those days. This is one of them. I rolled the dice and gotta say I love the recipe ideas!!! If you do anything, get these Recipe Dice and have some fun. They are a fantastic way to break the ice with children, guests, and family. We had and will continue to have fun with them. Be sure to visit Leafcutter Designs on Facebook. In a large sauce pan combine tomato sauce and diced tomatoes. Add onion and simmer to allow the onions to soften. Add the basil and rosemary. When this has simmered down a bit and become denser add spinach. It will wilt quickly. Add in your cooked sausage and warm through. You can either add in your ravioli or re-warm it in the microwave. Serve it with some garlic bread and you have a simple yet filling dinner on your plate. 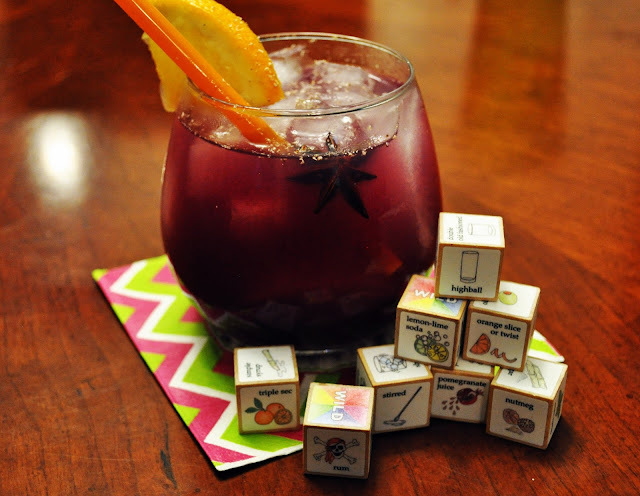 This cocktail dice set from Leafcutter Designs was so much fun! I had a great roll the very first time - it had so many ingredients that I already love, so I made my very own drink, Tequila Splash! I think these dice would be a perfect gift for someone special, and you're sure to impress your friends and family with your bartender skills. I hope you enjoy this easy, refreshing drink recipe! 1. Add the tequila, triple sec, and cranberry juice to a shaker filled with ice. 3. Pour into a double old fashioned glass, over ice. 4. Rub the mint leaves between your fingers to bruise them a bit (this brings out the flavor more!) and add to your drink. 5. Add a splash of ginger ale. Add more if you like an extra "zing". 6. Garnish with an orange twist or slice. 7. Cheers, drink and repeat (optional)! I am an eggoholic. Self-proclaimed and verifiable. When we got the recipe dice from Leafcutter Designs, I was worried. I made Bill roll them. I was gonna blame him for anything odd that happened. Well, it didn't. I got eggs and some other ingredients. The first thing he said was "you need to make that omelet thing you do". "I don't do an omelet thing", I said. He said "the loaf thingy". I said "oh, heck yes!!!" I would love to introduce you to a go-to dinner, lunch or breakfast that is simple and terrific. Please know that you can use ANYTHING you want in this recipe. This is just a guideline. Yep, that simple. Oven to an easy 300°F. Prep a small loaf pan by spraying with cooking spray. I combine the eggs until well mixed. Salt and pepper at this point. Add all the other ingredients. It will be thick, but that's what you want. 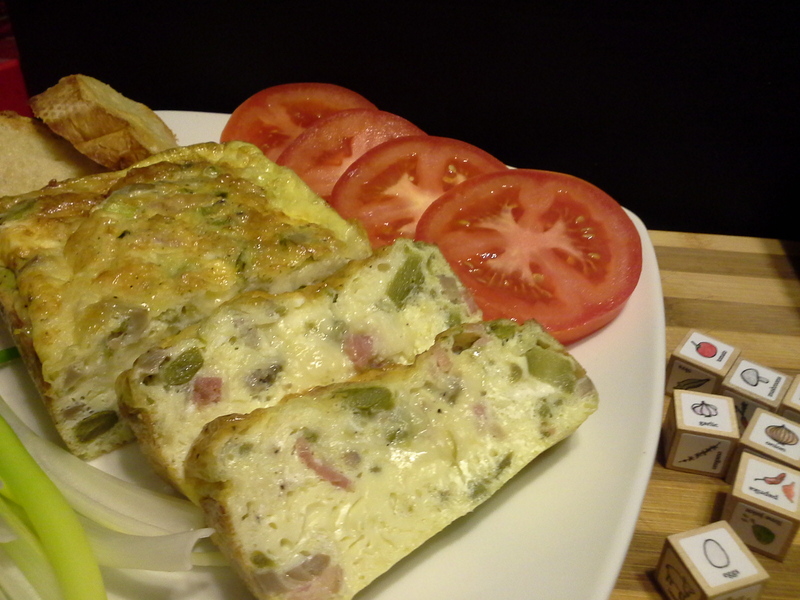 The egg is a just filler for all the other good stuff in the frittata. Pour into the prepared pan. Bake until it is not wiggly in the middle, about 25 minutes. Each oven will be different. Take out of the pan and let set for a few minutes. Slice and serve. I love serving with some sliced tomatoes and additional green onions. Add a hunk of French bread and you are set!!! Let me know how you make yours.......I would love to know!! 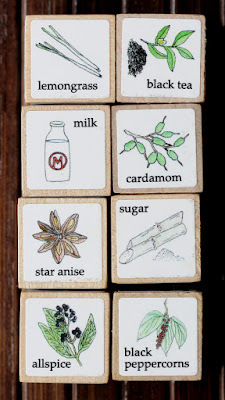 And if you'd like a little fun with a recipe, I highly recommend grabbling some of these recipe dice from Leafcutter Designs. Leafcutter Designs, based out of Berkeley, CA, has a wonderful little item: Recipe Dice. This set of twelve dice is made of solid wood, and features more than 60 seasonal vegetables, grains, meats, spices, and herbs. With a simple roll of the dice, these cool cubes will provide endless suggested menu combinations! What a terrific gift idea for the foodie in your life. In addition to a vegetarian version, they offer Cocktail and Chai Dice, too! My roll for this recipe included: Chicken, oregano, broccoli, bok choy, onion, bell pepper, parsley, rice, and lemon juice. Taking a cue from the bok choy die, I made this dish with an Asian flair, adding garlic, soy sauce, hoisin sauce, oyster sauce, and sesame oil. Delicious! Preheat oven to 350°F. Prepare a shallow baking pan by lining with foil, arranging rack on top, then spraying with nonstick cooking spray. Set aside. Place chicken in a shallow baking pan. Season with salt, pepper, garlic powder, oregano, Aleppo. Drizzle with 2 Tablespoons soy sauce, oyster sauce, hoisin, and sesame oil. Turn to coat evenly. Set aside for 30 minutes, or cover and refrigerate overnight. Arrange chicken thighs on rack and bake for one hour, or until cooked through, basting once or twice with fat from the pan. This will help “lacquer” the chicken skin. Remove from oven and cool slightly. In a large wok or Dutch oven, heat peanut oil over high heat. Add broccoli and season liberally with salt and pepper. Let rest in wok until browned on one side. Toss until edges are browned, but broccoli is still firm, about one minute. Remove to a dish. Add onion, red pepper, and pinch of brown sugar. Stir fry until browned, about one minute. Remove to a dish. Add more oil if needed to coat wok. Heat until smoking, and add bok choy. Toss to coat; cook until leaves are slightly wilted. Add garlic, and season with salt and pepper. Add water, continue cooking until edges are slightly brown and stems are fork tender, about one minute. Add remaining teaspoon soy sauce and sesame oil. Remove to dish. To serve, arrange bok choy, peppers, chicken thighs, broccoli florets, and onions as desired. Sprinkle with lemon juice, garnish with parsley, and serve with rice. If it seems a little silly to roll dice to choose ingredients for a recipe ... well, it is. In a very fun way. 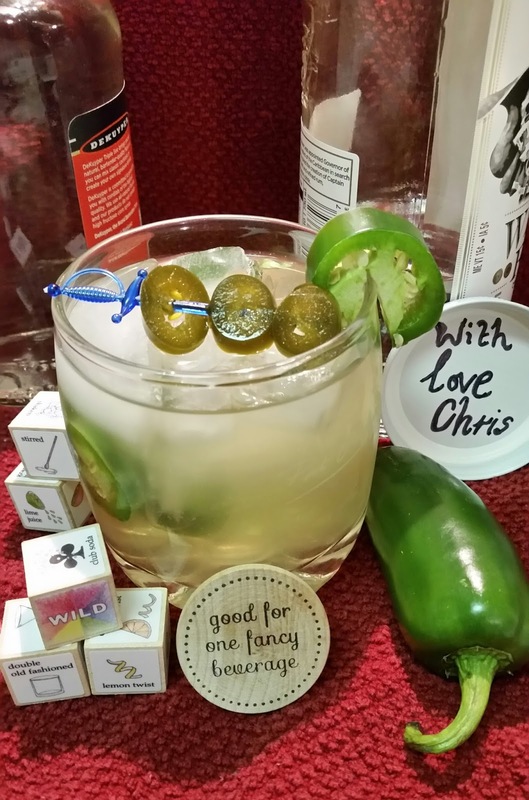 I've been having a blast with the chai, recipe, and cocktail dice from Leafcutter Designs. It's fun to let the dice choose ingredients for me. Since I'm not an expert in chai, I really haven't experimented with different flavors, so I liked the idea that I could just roll the dice and just go with whatever appeared. Since I got the chai dice, I've rolled quite a few drinks, but this time around, I decided to give the recipe a bit of a twist and make ice cream. I used the ingredients the dice suggested, and I added a few more, and I think I rolled a winner. Combine the cream, sweetened condensed milk, star anise, cardamom pods, lemongrass, tea bags (tear off the little paper tag - you don't want bits of that in your ice cream. Ick. ), allspice berries, peppercorns, and salt in a heavy bottomed saucepan. Bring to a simmer. Let it simmer gently for just a minute or so. Give it a little stir to make sure all the spices aren't just lazily floating on top. Turn the heat off, add the vanilla, and transfer all of it to a storage container. Let it come to room temperature (or close enough), then refrigerate until fully chilled. Strain the mixture through a fine-mesh strainer to remove all the spices and tea and whatnot, and discard the spices and tea and whatnot. Churn the cream mixture in your ice cream maker according to the manufacturer's instruction. Transfer to a storage container and freeze until firm. *You don't actually need tea BAGS. If you buy loose tea, use that as-is. No need to put in in a tea strainer or other device - it will get strained out along with all of the other spices. We were all so excited about our newest sponsor, Leafcutter Designs. They have all kinds of nifty products! We were given the opportunity to create some new recipes using their unique dice sets. The cooks had their choice of Recipe Dice (regular or vegetarian), Chai Dice, and Cocktail Dice (yep, our cooks LOVED the Cocktail Dice). Leafcutter Designs is a creative studio in Berkeley, California. It's run by artist Lea Redmond and her brother Devin. Their mission is to create a more playful and peaceful world by offering "curious goods, unique promotional and custom products, and participatory social art projects." They offer custom invitations for events, promotional products, and direct mail concepts. Leafcutter Designs says "We love finding just the right idea, thing, or words to deliver your message with creativity, personality, and maximum impact. Our participatory projects invite you to experience life in whimsical, thoughtful new ways, and are open to all. Whether you're a knitter, a writer, a romantic, or just about anything else, we'd love to include you in these creative adventures." So, come along with us as we "roll" out some fun new recipes all created with a toss of the dice! For more about Leafcutter Designs, follow them on Facebook, Pinterest and Twitter.